The following is a customer story from Brian Hilburn. This is a typical IFR6 Success story. My situation, I’d gathered, was not an altogether uncommon one: a 300 hour private pilot who had been plugging away at the instrument rating, in frustrating fits and starts, for a few years. Despite having wonderful instruction at my home field, various forces (including my own busy travel schedule) always seemed to conspire against me. Approaching the two-year expiration of my instrument knowledge test, and with an open window in my work schedule, I recently decided to explore options for a finish-up IFR course. I hoped to find a school that would work with me, my schedule, and my plane– a rather bare-bones Cherokee 140 with a nonstandard “shotgun” panel and a few other oddities that had me questioning the wisdom of paying for a rental plane that would, in the end, be unlike the oddball I’d be using in the future. “Train like you fly,” as they say. That is when I happened upon the website of IFR6, an accelerated six day finish-up course recently rolled out by Charleston Regional Advanced Flight Training (CRAFT) at Charleston International (KCHS). Their approach was immediately attractive to me: it combines a moving base Redbird FMX flight simulator, and one’s own airplane (rentals are also an option, as CRAFT handles bookings for several local aircraft). 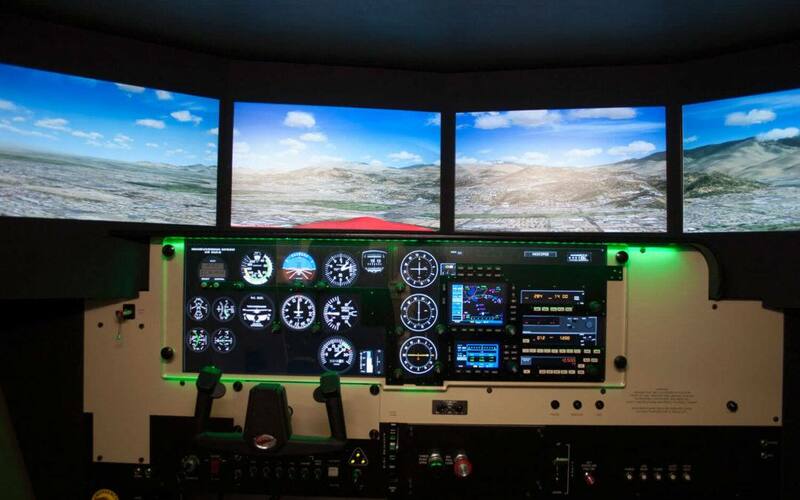 The logic was compelling: Given that the instrument ticket, perhaps more than any other, relies so heavily on mastering procedures and muscle memory, why not leverage the power of modern simulation technology as a adjunct to in-aircraft training? Recent advances in such technology mean that moving base simulation (the Redbird line is a good example) has never been as high fidelity nor low cost. This, it seemed to me, is the direction that flight training should be taking in the 21st century. So with books, papers and a few changes of clothing in tow, and having secured from my dearly-beloved a weeklong leave-of-absence, I recently set out on the longest cross country flight of my career, 500nm to KCHS. CRAFT is housed in an FBO building, sandwiched between the airline terminal and the Boeing 787 assembly facility (more on this later). On entering the small, spotless CRAFT office, my first impression was of the Redbird FMX, a hulking device that seems to occupy a quarter of the single room. My second impression, an instant later, was the warm greetings of owner Mike McCurdy, and instructor Jim Madison, whose patience I would come to severely test over the coming days. As advertised, the days were long and intense, and each was structured around a cycle of sim work, airplane time, and homework. Also as advertised, the simulator turned out to be invaluable in terms of time (in the time required for one “real” approach, I could shoot three or four simulated ones) and fuel (no 9 GPH burn in the sim!). Moreover, the sim features an all-important PAUSE button that allows for offline discussion of finer points. In a show of tough love, Jim weaned me off of the pause button by day five or so. In the end, the program worked and I passed my checkride. More importantly, I came away with an understanding of how to fly IFR, including both instrument flight per se, but also flying in the IFR system. Having said that, the course did reinforce for me the old adage that we merely get a “license to learn.” If this is true of the private license, it now seems doubly so of the instrument rating. This is not an indictment of CRAFT, rather a realization that we pilots must never stop learning. Nor is it an indictment if CRAFT that (full disclosure here) the program ended up taking a total of eight days. As it happened, problems arose even before I arrived in Charleston, as weather forced me to divert to Columbia, SC and drive a rental car the remaining 100 or so miles to Charleston. It would be day three before weather would break and I could drive back and retrieve the plane. Further, we lost most of day four tending to a glitchy glide slope indicator (thanks to Stick at nearby Rogers Aviation for working both avionics and scheduling magic). All in all, this was far and away one of the most challenging and rewarding weeks of my life. To those looking for an accelerated instrument finish up, I cannot recommend this approach highly enough. In particular, the greatest thanks must go to my instructor Jim, who essentially severed all contact with his family for a week, and devoted himself around the clock to my training. I especially appreciated his brilliant insight, round about day four, that my approaches were much better when I talked to myself. From that moment on, I was forced to babble away, in a sort of running self-commentary. It has to be noted that this course is not intended for a fresh private pilot, but rather for someone who has had some IFR training. To this end, IFR6 is careful to spell out prerequisites regarding flight hours, time-in-type and instrument training hours. Notice that the IFR6 approach is an alternative to the “we come to you” instrument courses. Though it might be a matter of preference, I placed value on being away from my normal routine and distractions.